Envitech's Venturi Scrubber efficiently removes particulate. The inlet can handle gases up to 230ºC (450ºF). Higher inlet temperatures can be accommodated with the addition of a quencher to saturate the gas before entering the Venturi. Tangential inlet ports ensures the walls are fully wetted to eliminate wet/dry line build-up. Scrubbing liquid is introduced into the Venturi throat through open pipes -- not nozzles -- to ensure uniform liquid distribution for maximum particulate collection. Dust-laden gas and scrubbing liquid collide in the throat. This disperses the liquid into drops on which the particles impact and become trapped. An adjustable throat or reflux damper can be used to allow flexible operation with varying flow rates or particulate concentrations. 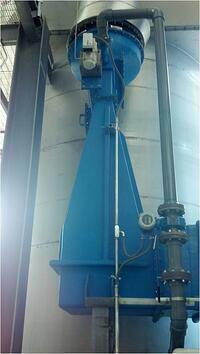 An Entrainment Separator removes drops from the gas stream before exiting the scrubber. 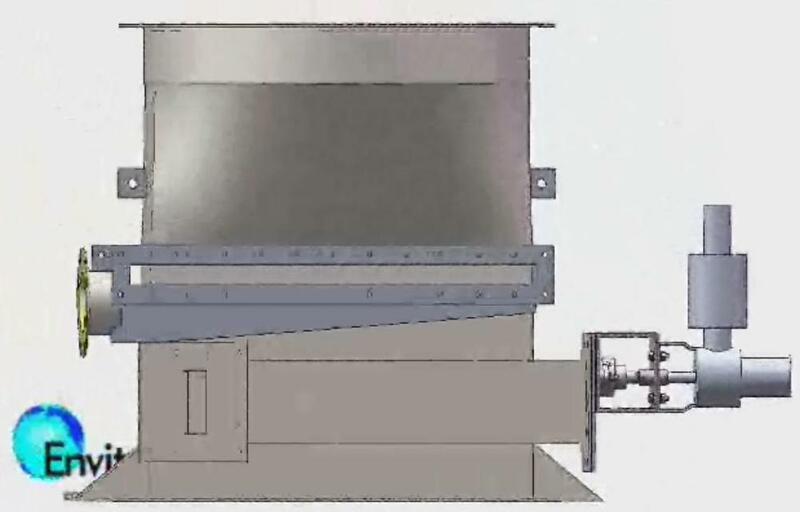 The entrainment separator serves as an integral recycle tank or sump. Completing the design, the arrangement may be either a vertical or horizontal orientation. Envitech’s Venturi scrubber can be supplied as a stand-alone device, or it can be integrated as a key component to a more complex multi-pollutant system. In applications with a large fraction of sub-micron particulate, the Venturi can be coupled with sub-cooling to grow the size of particulate for easier removal by the Venturi. In many cases this can reduce the pressure drop and fan power consumption by as much as 50 percent. For the most demanding applications, a wet electrostatic precipitator (WESP) can be added as a final polishing step. Pressure drops can range as low as 10” water column (W.C.) for large particulate to as high as 65” W.C. for gases with a high concentration of sub-micron particulate. Available materials of construction include T304SS, T316SS, fiber reinforced plastic (FRP), AL6XN, Hastelloy C276, Zeron 100, Alloy 20, and titanium.